Of my ancestors, the earliest we know anything about is John Bambrick, born 1791 in Windsor, England. His parents were Valentine Bambrick (b1770, in the parish of Longford) and Frances Bambrick (b17__, nee Logan). I haven't been able to trace further details about his parents. What we do know is that he had at least two brothers and a sister: Robert Bambrick (b1798), Valentine Bambrick (b1802) and Mary Bambrick (b1805). John fought at The Battle of Waterloo, on 18 Jun 1815, in the 11th Light Dragoons as a Sergeant in Captain Thomas Binney's Troop. 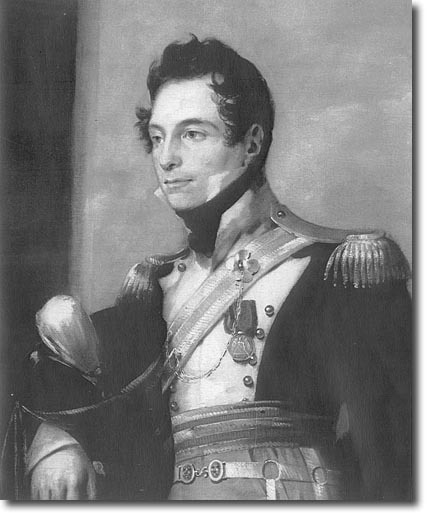 John's younger brother Robert Bambrick (later "Captain Bambrick") also fought at Waterloo, as a Private in Captain. J.A. Schreiber's troop. Napoleon Bonaparte was defeated in that famous battle. Had Napoleon realised he would be coming up against two Bambricks, we can only assume he would've called in sick that day. Here's a picture of Captain Thomas Binney. 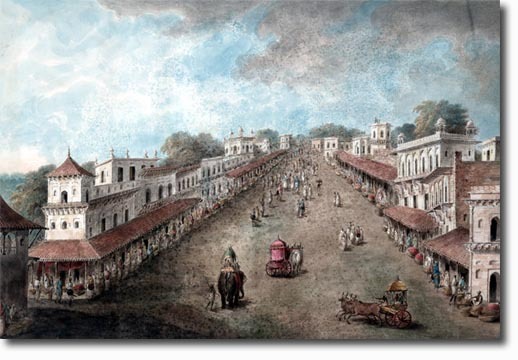 After Waterloo, we know John and Robert were stationed with the 11th Light Dragoons in India and both served at the siege and capture of Bhurtpore. (Sometimes spelt Bhurtpoor). A number of the children were born in Cawnpoore, India. There was a mutiny in Cawnpoore in 1857, but they would've been born prior to that. Here's a depiction of Cawnpoore, pre mutiny. This is an engraving from 1814. It shows the hustle and bustle of a normal barracks town. On the 12th of September 1838, "after long and faithful services" he was discharged from the 11th Hussars, and retired to Windsor. His sons and younger brother meanwhile, went on to do a bunch of things. John's medals were sold, in an online auction, for £2,500 in 2014. The churchwardens of Windsor have received a letter from the War-office, stating that troop serjeant-major, John Bambrick, a native of this town, who was discharged from the 11th Hussars, on the 12th of September 1838, after long and faithful services, has been awarded the gratuity which is granted by her Majesty to discharged soldiers who have conducted themselves meritoriously while in the army; and the authorities of the War-office notify that fact to the churchwardens with the object of making it generally known in the parish to which he belongs. October 1966 Notes:	Served in Captain Thomas Binney's troop. Sold originally in group with Bhurtpoor A of I and L.S.G.C. Medals in 1966. Sold with just A of I medal in 1970. The Waterloo has clip and ring suspension and the naming is stated as being dubious. Sold on a non return basis. John Bambrick was born at Windsor, Berkshire, and attested for the 11th Light Dragoons at Bedfont, Sussex, on 20 August 1814, aged twenty-three. He fought at Waterloo in the rank of Sergeant, and at Bhurtpoor as Troop Sergeant Major. He served a total of eighteen years 332 days in the East Indies, returning to England in June 1838, where he was discharged on 12 September 1838. His Army of India medal was in the Needes Collection of 1940, and sold at Glendining’s in November 1903 and May 1970. Sold with copy discharge papers and other research. Mary Ann Bambrick, 1805 - 1883 Mary Ann Bambrick was born in 1805 to Valentine Bambrick and Frances Bambrick (born Logan). Valentine was born in 1770, in Parish of Longford. Mary was baptized on month day 1805, at baptism place. She had 4 siblings: Frances Bambrick and 3 other siblings. Mary married Unknown in month 1861, at age 56 at marriage place.